I LOVE JIM Harbaugh. I can't wait to see what he does when Michigan hits the field this fall. 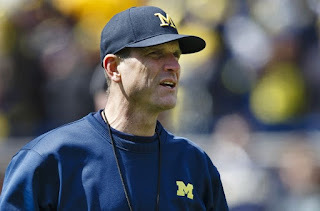 Harbaugh, the new Michigan football coach, rubs people the wrong way and unabashedly bleeds maize and blue. Love, love, LOVE. Now he's making news because an ESPN radio guy ended their interview early. I don't know the interviewer, and I've never listened to him, because radio guys tend to like the sound of their own voices. We have enough school board members and politicians like that. I did listen to a recording of the interview and read some of the press coverage. The interviewer, Colin Cowherd, said he was trying to sell the Michigan program. That's not his job. He can ask all the creative and awkward questions he wants, and certainly Harbaugh contributed to the debacle, but I think Cowherd dug his own grave here with a lot of dumb questions. Not that it really matters. I interviewed a million people during my 24 years in journalism. Most were cordial and professional enough. The ones who didn't want to talk or were difficult, well, I dealt with it and moved on. It's the state of our entertainment world and culture today. Who cares if an interviewer pulls the plug early? It's not about him. But it trends on our social media sites and we get sucked into the stupidity, anyway. I'd like to say I'm going to end listening to Cowherd early, but I don't listen to him at all.